Javier Bardem in Milos Forman's Goya's Ghosts. One night in a tavern Ines (Natalie Portman) decides not to eat the roast pork; it is not a dish she particularly cares for. The next thing she knows she is being tortured by the Inquisition on the grounds that her dietary preference is dictated not by taste but by a secret adherence to Judaism. She is then jailed (for 15 years), impregnated by her chief tormentor, Father Lorenzo (Javier Bardem) and driven mad, largely because her child is taken from her. And what does that have to do with the eponymous Francisco de Goya (Stellan Skarsgard), that greatest of Spanish painters and precursor of modernism? Very little, as it turns out. He painted Ines, and her wealthy father was one of his patrons. But in Goya's Ghosts he is pretty much what he was in life  the politically temporizing foreground observer of Ines' anguish, which is symbolic, in its way, of Spain's anguish as the 18th Century turned into the 19th, its royal family deposed by the bloodily invading French, who were, in turn, defeated by the British. Mostly (and this is historically true) Goya wished to pursue his genius unhindered by political intrusion. If that meant painting portraits  many of them subtly touched by his loathing  of all his country's rulers, that was all right with Goya. Many of his greatest works, notably the etchings depicting man's inhumanity to man, either circulated anonymously or were not published until after his death. In Milos Forman's film (which he co-wrote with Jean-Claude Carriere, the great French screenwriter, perhaps most famous for his collaborations with Luis Bunuel) Goya's escapist politics is another sign of his modernism. The great artists of the 20th Century sympathized with "progressive" causes, but rarely played a heroic role in them. But the entire film is less an exercise in historicism (though the portrait of the painter is accurate enough, as is the depiction of historical events, the story is pure fiction) than it is an elaborate analogy with our own times. This is quite understandable  Forman lost his parents to the Nazi concentration camps and came of age in Communist-ruled Czechoslovakia, and he has long needed to address the issues that shaped his life in a movie. Goya's Ghosts is not entirely successful in doing so. Though it is made on a crowded an epic scale, it is going to seem remote to many viewers. It has structural problems  a jump in time of 15 years right at its center  and Portman makes an unfortunate, almost ludicrous, choice in her portrayal of the older, post-prison, Ines On the other hand, it has about it a kind of messy passion that is quite fascinating. It obviously means a great deal to its auteur, and that passion grants the film a felt and wayward life not usually granted historical epics. 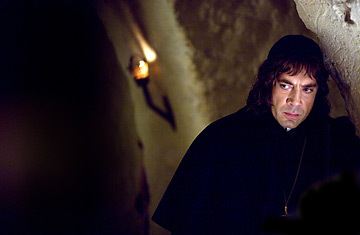 That judgment applies particularly to Bardem's performance as the loathsome Lorenzo. In the beginning, as he volunteers to lead the newly revived Inquisition, he is all soft-voiced reason. He is polite to the point of obsequiousness, not only to his church superiors, but even to the people he torments. Creepy, well-met and utterly corrupt, and when the French invade he simply disappears  only to reappear later as, of all things, a Voltairian rationalist, married, with children, and growing rich as an enforcer for Spain's occupiers. He is, in his way, also a perfect modernist, blowing blandly and prosperously with the winds of change. As long as there is power and status to be had, he does not care who he must serve to obtain those boons. By analogy, Goya's Ghosts has much to say, largely through this character, about such current issues as torture, terror and the fact that some people can profit hugely by making up ideological justifications for the anarchy they loose upon the world. If you find yourself thinking about, say, Abu Ghraib while you're watching this movie, that's OK with Forman and Carriere. What I found myself thinking about, curiously enough, was Les Miserables. Whether you steal some bread or casually decline a slice of pork, in certain situations terrible consequences can ensue from such seeming inconsequences  not to mention a narrative of epic proportions. I'm not saying that Goya's Ghosts is ever going to be regarded as a world-historical masterpiece. But it has grand scale and grand ambitions, and in the midst of our annual silly season at the movies I would like to suggest that, flawed as it is, the film does reward our serious attention.